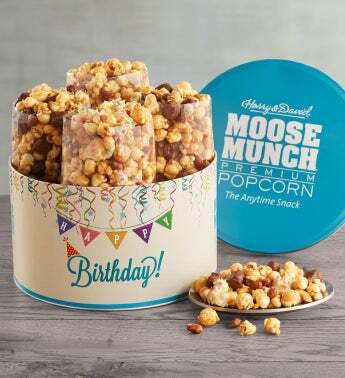 Birthdays are better with Moose Munch® Premium Popcorn, so celebrate with a festive tin full of the anytime snack. We've included favorite flavors like classic caramel, milk chocolate, and dark chocolate, as well as our specially crafted birthday cake variety featuring colorful confetti. It all comes in a decorative tin for a gift your recipient won't soon forget.